4. This is a X-Ray chest of a 10 month old boy Munshigonj, came with the problem of not growing well, pallor. The child was otherwise ok. No history of respiratory distress. What are the findings here? 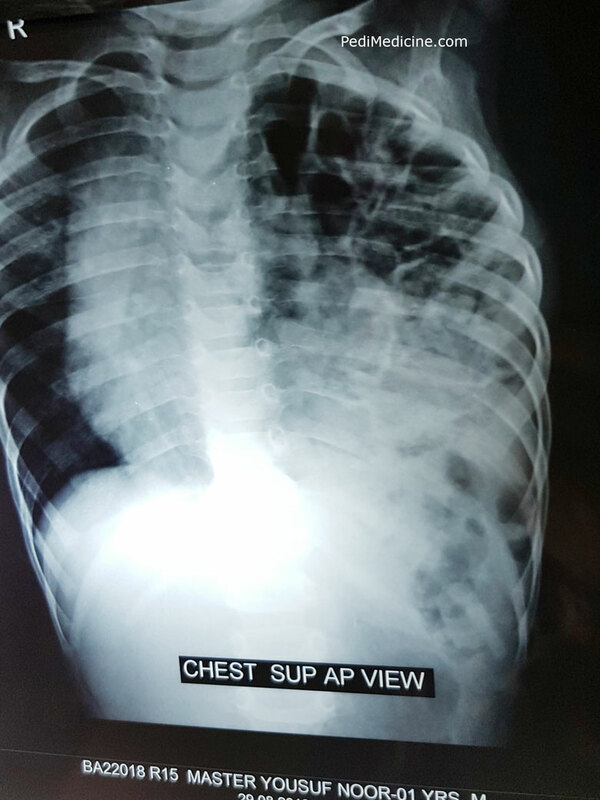 Chest x ray showing mediestinum shifted to right side, and gas filled loop occupying the left mid n lower zone. d/d. 1. congenital diaphragmatic hernia. CDH. But as the child has no resp. distress. Other causes of FTT with pallor should be evaluated. Cong diaphragmatic hernia.Earliest repair the better.Otherwise left lung will have hypoplasia.To accomodate these loops of intestine and stomach in the abdomen may be difficult. Respiratory cause of Failure to thrive in an infant without a breathing problem.This was a surprise finding. Related discussions: Congenital diaphragmatic hernia. In CDH there may be a ‘honeymoon period’ during when pt may be asymptomatic. The Honeymoon period is 48 hours (Nelson). The C/F usually presents within 6 hours.